I have a bad case of FOMO and love knowing what's going on so when a young coworker showed me this new bridge in Vietnam where I would be travelling for work... I had to investigate. After mixed information from other colleagues in Vietnam, I heard it wasn't too far from where I would be working in Phubai. Google searches were not very helpful to confirm or deny that info - I was told it was very new so not much information is out there. Of course that made me want to go even more. With a weekend off and already seen the beautiful sites in Hue where I was staying I headed off on my adventure. What I did know from talking to the locals is it's located in the Ba Na Hills in Danang. I was told I should see Danang (and Hoi An) anyway so from Hue I decided to get a hotel for Saturday night in Danang. To get myself there I booked a "limo" from my hotel in Hue to Danang. Limo was really a van full of travelling young women but for $160K dong it wasn't bad as long as I closed my eyes and went to sleep as to not think about it too hard. From the outside, my limo looked fine but that inside was another story. I climbed over the young women in the van to take the last seat in the back corner, trying not to trip over poorly laid floor carpet. Glancing up I noticed the roof had been repaired with plexiglass to prevent water leakage. I would watch the water behind the plexiglass like a framed dynamic sand picture at a shopping mall kiosk. Mesmerized I hoped it would hold out until I got the heck out of there. Luckily it did. Next time I'll take a Grab. The driver drove fast and the suspension on the van, I mean limo, was so shot I felt like I was in a bouncy house. I did manage to doze off and awoke to a dead stop, thinking I was there. Nope, I was in traffic in a tunnel with no exit in site. Great, this is how it ends... dumb group of women traveling in a van taking us into some shady dark tunnel. Just as I told myself my $40 USD a night hotel wouldn't have sold me out like that we started moving. Phew, close call! Again I close my eyes hoping the woman in the seat in front of me is wearing a mask while she is coughing non stop. Loud phlegmy coughs fade away as I drift off to sleep. I was next jolted awake by the stop of the van and grind of it being put into park. We must be at the city center as I realized he has hastily pulled into the back of a shopping complex. He opens the back to get our luggage while giving me a stern stink eye as I haven't paid him yet. He passed out the baggage and I handed him my cash, thankful to have made it safe. From city center Danang my next $40 USD a night hotel was .8 miles away so I made the walk through the busy city, maneuvering through sidewalks of people going about their business. Washing dishes, parking motorbikes, people eating, people drinking... so many people. At the hotel I was greeted by a very helpful front desk woman asking what brought me to Vietnam. After small talk about my work I cut to the chase about this bridge. "Oh, you want to see the bridge" she said as if I just turned on a switch making her understand my existence standing in front of her. I told her I was hearing so many different stories about where it is and I'm not great about direction anyway so I need help. She again looked confused and blurted out "how are you going to get there?" quizzing me again, solo female traveler with just my backpack that was so off putting a few minutes ago. I told her I haven't gotten that far yet.... I pulled out my phone and asked if what I thought it was is correct as I also heard rumors it was so new it isn't even on google yet. She took a look and said "yes, that's it." Finally, an answer I thought... before I could say another word she went into a spiel I'm sure she recited thousands of times. Here's what I learned. The bridge is located inside a park called Sunworld, about 50 minutes from Danang. To get there I took a Grab (the Uber of Asia), it was about 303,000 VND from my hotel. Sunworld entrance tickets for foreigners is 700,000 VND. You can get tickets in advance or at the ticket office in the park. I got mine at arrival and all was fine but it is cash only (no credit cards). When looking at the main entrance in the center, it's over towards the left side. To get to the bridge you will take a 20 minute cable car ride. The ride holds 2 Guinness World Records. One for the length of the cable and another for the biggest difference in elevation from beginning to end. I'm terrified of heights but the view is beautiful. There are barf bags in the car if needed! I did ok but found the beginning of the ride to be the scariest as it's a bit of a jolt. I closed my eyes at that part and felt much better about it. The park is up in the hills which has fog roll in every morning. My hotel helper advised the best view is at 9am but she warned it is very crowded so don't go too late after 9. I am not a fan of crowds so I arrived a little after they opened at 7am and there was no line. I did see fog come and go during my visit (it was foggy when I arrived but cleared up when I left a little after 9). When I left after 9 the lines were very long; wall to wall people. Both coming and going I had a cable car to myself. On the way out most cars were empty and the bridge was full of couples getting wedding photos. On my way back most cars were full and the bridge was crowded with selfie taking people so many it was difficult to maneuver through the crowds. My final tip from the hotel was the warning "the pictures online look much better than the pictures you will get". I nodded understanding that I won't be seeing an empty bridge from a far away angle like I saw online. She continued "those photos are taken from up high when park was closed". I nodded and thanked her for all her advice. When all said and done, I'm glad I took the journey to the bridge. The park is beautiful, with reproductions of many styles of architecture. I loved seeing the view from the top of the hills and the gardens in the park. The park got very crowded and was filled with so many people taking selfies or getting their photos taken in front of every display, every statue, every flower bed, every building. I'm a fast walker so was a little stressful navigating through people with their selfie sticks getting pics every few feet. The bridge itself was created to draw more tourists in and it worked. The place was crazy busy! Before getting there I asked my local coworkers about it and all heard about it but haven't made the trip. They all are interested and want to go but just haven't made it yet. It was a haul to get there, took some planning for transportation but not terrible. There just wasn't a lot of mass transit routes there that I had found. The Grab was fine for me on the way out, but was difficult to get a Grab to get back to city of Danang. My final thoughts; was it worth it? Yes, the hills and park and gardens make it a sight to see. The hands part of the bridge, upon closer inspection, is just painted concrete so close up it's not as impressive as those far away shots. I personally prefer history and natural beauty so a spray painted concrete hand was a little sad up close. The view and engineering of it was definitely impressive. The hills themselves and cable car ride make this a definite add to anyone's itinerary. Below are some photos of my journey. History, art, architecture and all things local are a few of my favorite subjects. These all are intertwined in an art project someone kindly shared with me. 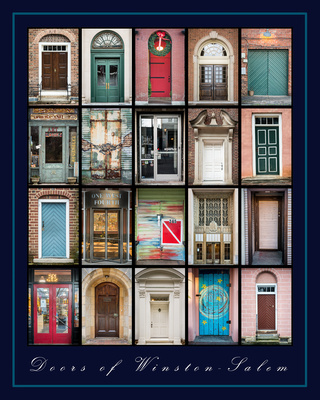 Doors of Winston by Jeff Silkstone captures the beauty of the city I live in. I love to read about history in my area and attend local events but am always running around from point A to B and not really noticing the beauty around me. Seeing this cool poster has changed me as I tend to slow down and view the beauty all around me, now in this interesting perspective, of doors! Yes, I cannot stop looking at doors in Winston now. There are so many beautiful ones! I appreciate this reminder to slow down and take a look at these doors! ​Please let me know if you find any beautiful doors on your journeys! Last weekend we were lucky enough to be 4 miles away from the launch of the travelling Corning Museum. Spevco in Pfafftown, NC is an awesome maker of specialized vehicles and opened this exciting event up to the public. The museum itself is a large semi truck that opens up to a fully functional glassblowing studio! The guys from Corning were there to try it out before it hits the road for it's debut at the upcoming Glass Art Society Conference in Virginia. It was amazing to see these masters at work on the back of a semi truck! Today we were lucky enough to join Krankies coffee cupping session. I've heard many great things about Krankies and this was the best possible way I can think of to experience this gem! The building is in an old near packing plant with bar up front, dining room in the center and roasting, packing and tasting room in back. They are a local small batch roaster that processes around 100,000 lbs/year. We did a blind tasting of 4 styles. On each side of the table was the same bean roasted different ways. It was fascinating to see the variations and even how each changes as the temperature changes. A flavor wheel was present to help those like us with limited palette vocabulary! My favorite was the Lemu, very rich nutty light roast from Ethiopia. I loved the smell and taste throughout the experience. As it cooled it reminded me of a strong black tea. My husband preferred the darker roasts and since he brews the coffee we went home with a bag of railhead today! The cuppings will be a regular Friday 10 am offering. We plan to go back as they rotate their beans seasonally. Besides cupping they have Tuesday night wine tastings I'm looking forward to checking out. Afterwards we had lunch in the dining room next to their art-o-mat! My husband went with a turkey sandwich special but mine was the winner... I come from Wisconsin so I have had a lot of these in my life but this was the best frickin' grilled cheese sandwich ever!!! It was on a hoagie bun with tomato, red onion, coke slaw and pickles the call the Griddled Cheese Hero. The cheese was provolone that was fried first to make it toasty and golden brown. It was such a unique combination with the cheese itself being grilled and topped with coke slaw and pickles just took it over the edge to greatness. This may be the best sandwich I have ever had! So besides awesome coffee they had homemade sodas which I love to make as well, I tried pineapple!.. but I was really jealous of those with cocktails as those were beautiful. They have their own garden they grow some of what they serve and just started beekeeping so looking forward to that honey! ​This place is a true gem with amazing people that opened their doors to us and made us feel like instant friends. We look forward to many good times here! Check them out at 211 3rd Street East, Winston Salem, NC and be patient with parking, lots of construction going on and not a lot of places for cars. It's no secret, one of my favorite places back in my home town of Milwaukee, WI is Braise. Their creative use of local ingredients never disappoints. How I came to know Dave and his passion is through his classes when he started the Braise travelling culinary school. My first class with him was in the back of the Outpost about chocolate. I know you can't go wrong with chocolate but he used it in some interesting ways... I'll cover more of that later because today I am craving Indian food! At Braise I took "Braise Basics: Indian Food" in April of 2015 and learned some great basic skills that I thought I could only get at my favorite Indian restaurants. Create spice mixtures by combining garlic, ginger, turmeric, lime juice, garam masala, coriander, cumin and cardamom in a small bowl. Whisk yogurt, salt and half of spice mixture in a medium bowl; add chicken and turn to coat. Cover and chill overnight or 4-6 hours. Reserve remaining spice mixture. Heat ghee in large heavy pot over medium heat. Add onion, tomato paste and crushed red pepper flakes and cook, stirring often, until tomato paste has darkened and onion is soft, about 5 minutes. Add remaining half of spice mixture and cook, stirring often, until bottom of pot begins to brown, about 4 minutes. Add cream and chopped cilantro, simmer, stirring occasionally, until sauce thickens, 30-40 minutes. Puree sauce until smooth. Add back to pot. Optional: preheat broider or grill. Grill or broil until chicken starts to blacken in spots. Add chicken to sauce and simmer until chicken is cooked through and tender. Moong Dal Curry - Creamy coconut based vegan Indian stew. Recipe by Dave Swanson of Braise, Milwaukee WI. Pick through the dal and remove any debris. Rinse the dal thoroughly under running water in a fine mesh sieve. Drain thoroughly. In a deep saucepan, bring water, curry powder and 1 tablespoon of oil to a boil over high heat. Add dal. Reduce heat to medium-low and cook, uncovered, 30 minutes, stirring occasionally, until dal is very soft. If the water starts to dry up, add another 1/2 cup water. Remove from heat and set aside. In a medium skillet, heat the remaining 3 tablespoons oil over medium-high heat. Add cumin seeds, mustard seeds; when they begin to sizzle, add onion. Saute for 7-8 minutes, until onions are well browned. Add ginger, chilies and garlic (tomato if using). Cook, stirring occasionally, for another 8 minutes; add onion mixtures, coconut milk and salt to dal. Bring to simmer, check seasoning and add cilantro, serve. Garlic & Herb Naan, Braise Culinary School Milwaukee WI - in class we used parsley! Combine flour, salt, sugar, yeast, and herbs in bowl of mixer. Whisk together milk and egg and add to dry ingredients. Mix with paddle on slow until a rough ball of dough is formed. Combine melted butter and garlic puree, then add to dough and mix with paddle on slow until fully incorporated. Place ball of dough into a bowl and place in proofer. Proof until 2-2 1/2 times the original size, about an hour. Portion dough into 2 oz balls, then roll out with rolling pin until 4-5" in diameter and about 1/4" thick. Place onto floured parchment lined sheet pan and place back into proofer and proof 20 minutes. Drizzle liberally with oil and place oiled side down on grill. Grill on a low flame. When the bread is easy to handle and is set and browned on one side, flip over. After grilling, brush both sides of naan with herb oil. Mix to taste. Top any of these dishes with this! To continue with my peep missing today, here's a review of the 2015 Peep Show at Racine Art Museum. They do a great job of putting together peep art. Lots of great Peeps Inspiration! Thanks to Newaukee's Young Professionals week today I saw a great presentation on The Laundromat Project in NYC. Their mission is to make art / wash clothes / build communities. They bring art to where people are and in NYC there are 2700 laundromats so they take it there... drawing, dancing, yoga, and more! The artists they work with build relationships in neighborhoods they love then introduce art into the neighborhood laundromat. Artist Sukjohn Hong spoke about her project in Queens where she worked in beauty salons to inspire the community to be creative. She offered creative writing and drawing classes and my favorite was she traded self portraits of people for neighborhood stories. All these things were combined to make a neighborhood magazine! Being vegetarian, I'm a huge fan of VegNews. I read about all the exciting vegetarian restaurants around the country and wish I was eating there. Last month while reading their list of best veggie burgers I was shocked to find not 1 but 2 in my hometown! How didn't I know about these so called best veggie burgers in the country?! I had to inquire immediately! #2 Comet Cafe... my favorite! I love their vegan comfort food! steak fries that are out-of-this-world. I repeat: out-of-this-world." Agreed, this was a great sandwich but in my opinion not really a veggie burger. It was a mess to eat, the mushroom kept sliding off the bun so I ended up ditching it and eating the stuffed mushroom alone. I think a great veggie burger is a patty of veggies and grains mixed up and paired with a great spread, toppings assembled on a perfect bun. Let me know if you've tried any here... or what did they miss that I should try? ﻿A rainy day in Milwaukee is a great day to get inside the art museum for Art in Bloom. I love seeing an end to winter by looking at the beautiful arrangements paired with a great work of art. Look!... that's me in the back right. I made the Discovery World email newsletter photo! Last year I took most of the Rishi tea series at Discovery World in their thirst lab. It was not only educational but fun and yummy. The only downside was it was difficult to fall asleep on class nights... caffeine overload! Stay tuned for my recap on the classes I made it to, we missed a few and hope to catch them this year. The schedule is on Discovery World's website. True Milwaukee girl, lived in a multiple areas in the state of Wisconsin and has traveled around the world but always remembers "where ever you go, there you are". Recent reviews by Jen Y.